A particularly well written volume about this beautiful area with photographs and stories of the many historic buildings that surround it. Included is Old Newton, the oldest surviving building in the area where, it is said, Bonnie Price Charlie called in 1745 and Sir Walter Scott wrote some of his poem The Lady of the Lake while visiting. In the same neighbourhood is Doune Castle, made famous by the film Monty Python and the Holy Grail and where Bonnie Prince Charlie housed 150 prisoners. Impressive Deanston House with its lovely conservatory was home to Sir John and Lady Muir for many years around the beginning of the 20th century then on their deaths became a private school, a convalescent home, a hotel, a nursing home again and finally a care home in 2007. 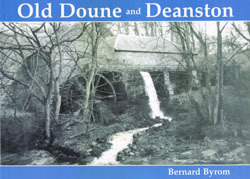 The social and industrial history of Deanston Cotton Mill makes fascinating reading and there are late 19th century photographs of the mill and some impressive pictures of its two 36� diametre Fairbairn water wheels in action.